This past weekend we were in Anaheim for LA Cookie Con promoting our recipe for The Nutcracker and the Four Realms. We also spent some time at Disneyland (now that we have Annual Passes we will be there a bit more often). We lucked out and it just so happened that we were there during their Lunar New Year Celebration. This meant we were able to try some of their Asian-inspired fares and share our thoughts with you! The rain made it a little tough and we had to rely on phone photos, but we promised you more food coverage so we are delivering! 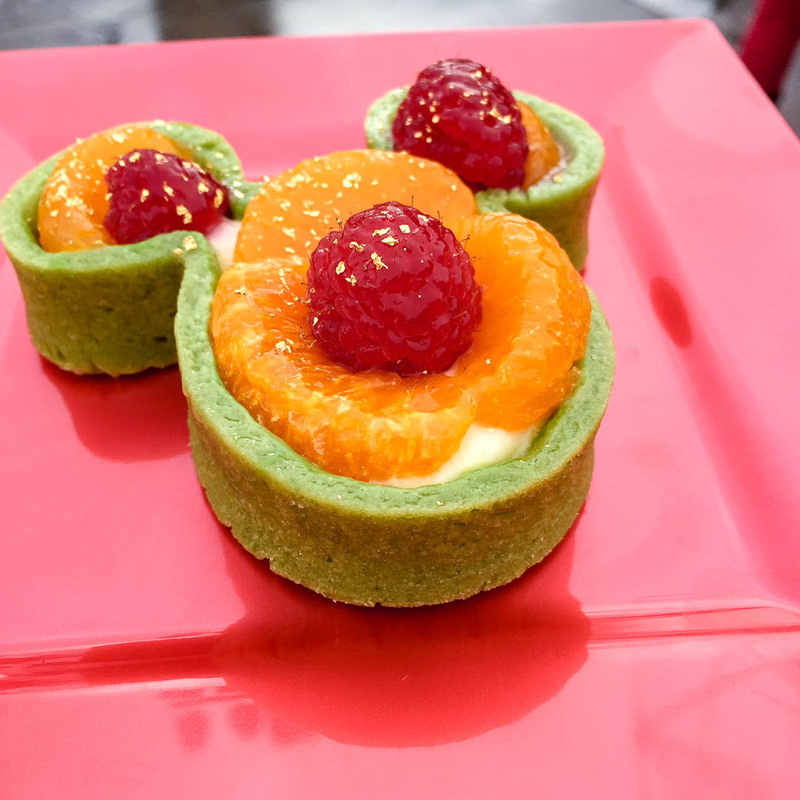 Mandarin Orange-Green Tea Tart- The green tea flavored tart paired perfectly with the sweet mandarin oranges and filling. This is a delicious sweet treat perfect for wrapping up your meal. Banh Mi- Banh Mi is always a solid choice when ordering Asian-inspired fare. 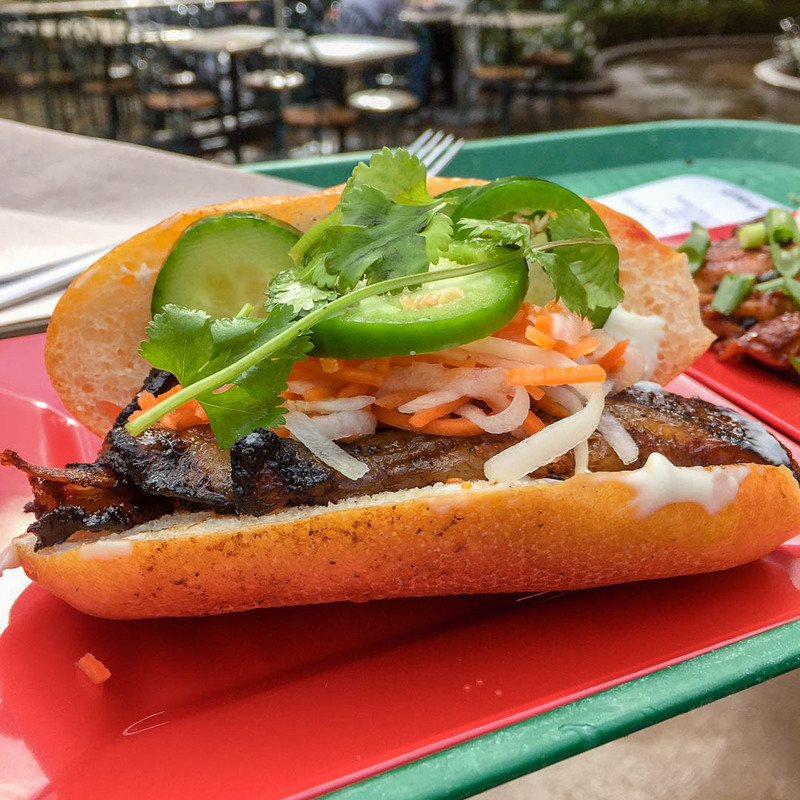 What is surprising about this particular banh mi is that not only is the filling tasty (not to mention, the pork belly is rendered beautifully), but the baguette is as equally delicious as well! This dish came in second for both of us. 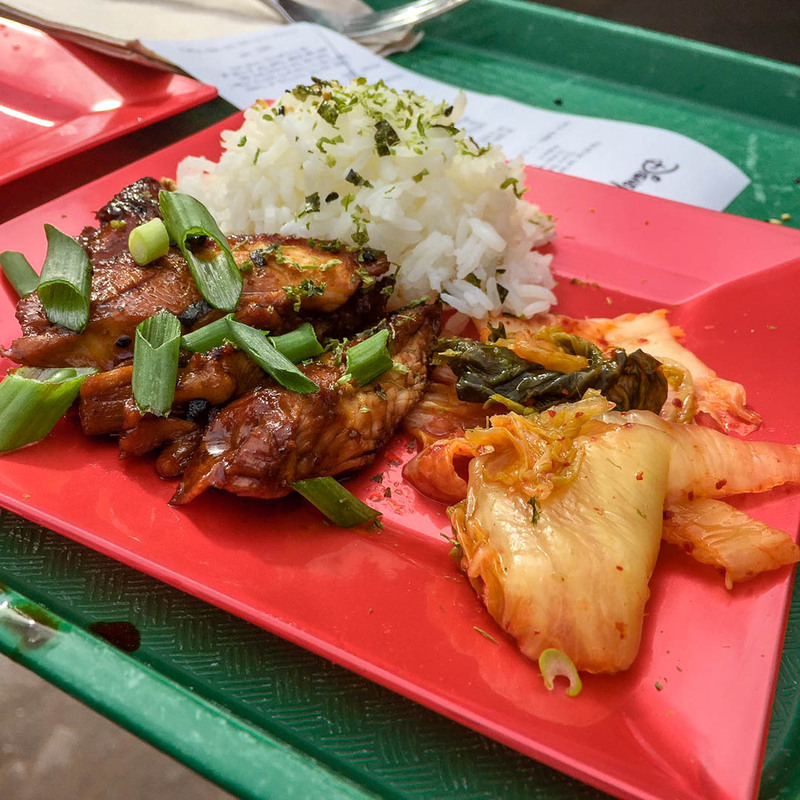 Korean Grilled Chicken- The Korean Grilled Chicken was another pleasant surprise for us. The sweet chili sauce does not overpower the other ingredients at all and the sides of rice with seasoning and kimchi make it a great snack! 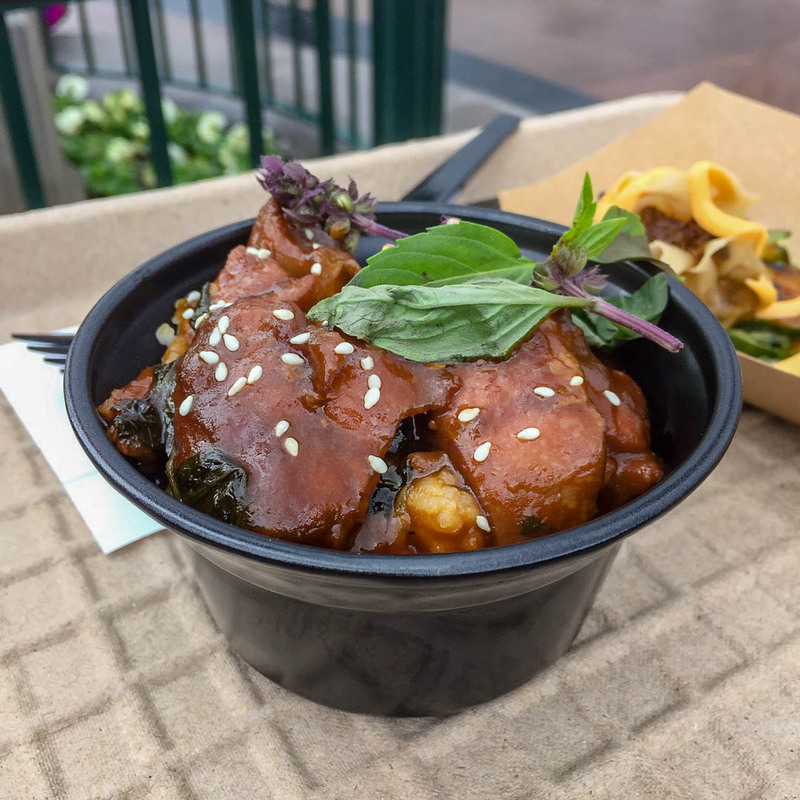 The only item we tried that we would recommend staying away from was the Gochujang Chicken Wings. Not only is the sauce lackluster but the wings themselves are not rendered well. This makes them super chewy and fatty. In fact, they seem to be baked and then kept in a steamer which means all potential crispiness is lost. We used Sip and Savor Passes when trying the various foods. We highly recommend it because it is a more affordable way to try a plethora of the Lunar New Year food options. According to the Disneyland Website, “each Sip and Savor Pass is $39, including tax. In addition to a reduced price ($36), Annual Passholders will also receive a special Passholder lanyard as well as buttons (at participating marketplaces upon coupon redemption). To receive the Passholder price and keepsakes, a valid Annual Pass and photo ID must be shown upon purchase. 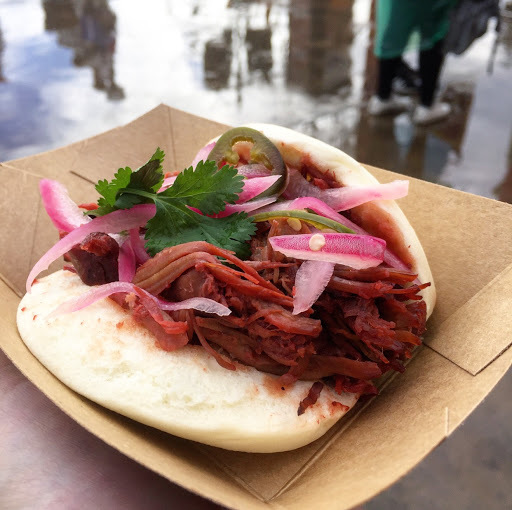 We really enjoyed our experience at the Lunar New Year Food Marketplace. If you get a chance to visit the parks before February 17th we highly recommend you check it out. You won’t be disappointed! Next → Next post: Lamplight Lounge: Is it Worth the Hype?